You are in the resale business when you, as a company or individual merchant, buy goods or services in order to sell them in turn. This calls for a kind of distribution or retail agreement with the original seller. 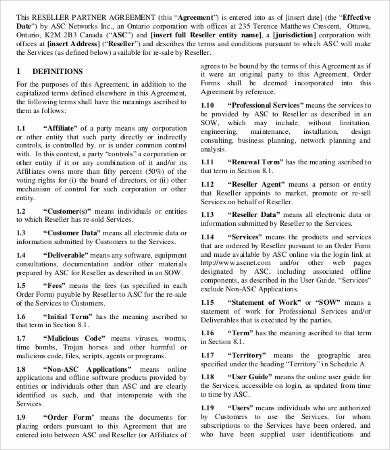 For that purpose, you can find an agreement template from this list for reseller agreement contracts. 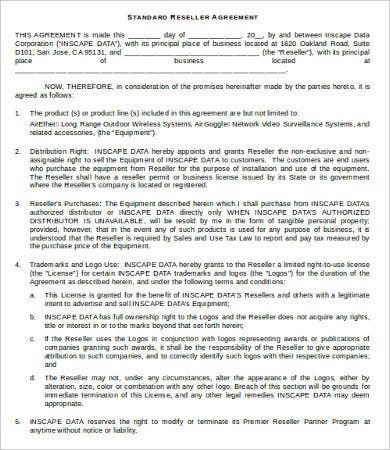 You can find a reseller agreement samples here for mostly anything you would be in the business of redistributing, whether it is a physical consumer commodity, software and Web domains, a company, capital goods like equipment, or partner services like advertising. 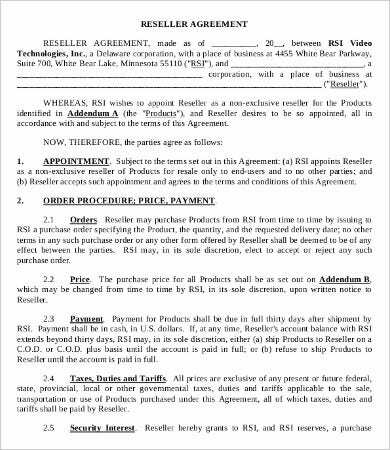 Why Do I Need a Reseller Agreement? 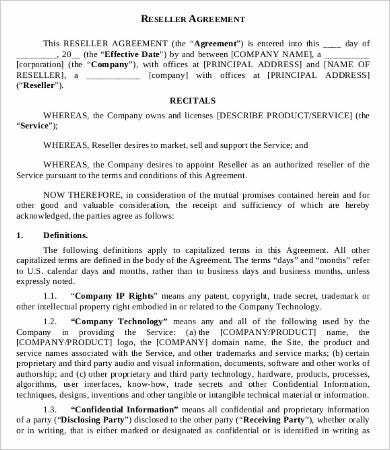 Like any Buy-Sell Agreement, the reseller agreement will seek to authorize you to sell something that you have already purchased legally. 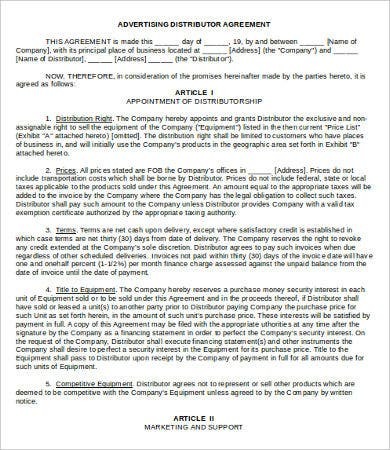 Your typical Sales Agreement will come with its own terms and conditions and sometimes even usage restrictions in regard to the commodity. Reselling these commodities for profit could be a breach of your original contract if it does contain a clause that allows for it. The best way is to go with a reseller agreement from the get-go. When Will I Need a Reseller Agreement? 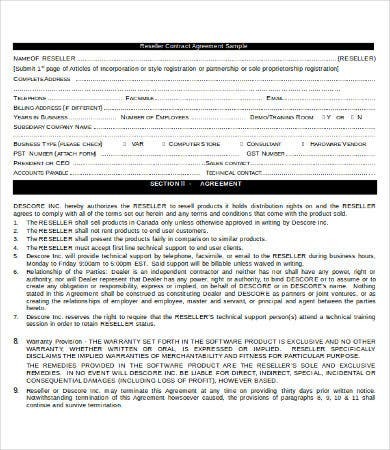 This type of contract is the usual business procedure for retailers buying from wholesalers, suppliers, and partner agencies. You will not need a reseller agreement if you were merely selling something you own on eBay or through a secondhand store or garage sale. 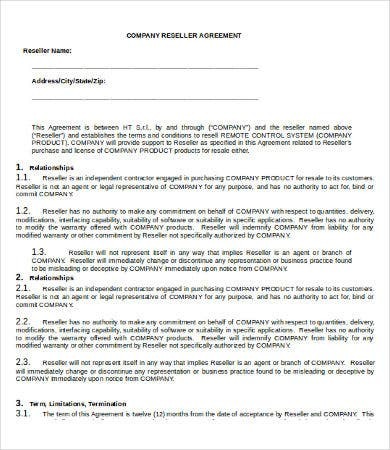 If you were running a for-profit business through these channels selling unused commodities, you will need this type of agreement from the seller, especially if you are buying in bulk. What is the first seller’s relationship to the end buyer, i.e., your customer? Will the original seller have any obligations with the end customer? Will you, the reseller, be modifying or bundling the commodity for redistribution? 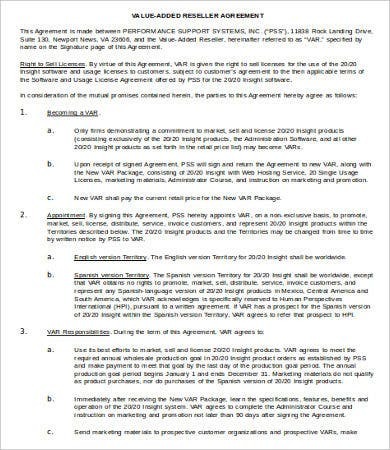 Make sure these considerations are addressed in the terms and conditions of the reseller agreement to avoid legal lash back from both sides of the supply chain. How Can I Use These Templates? 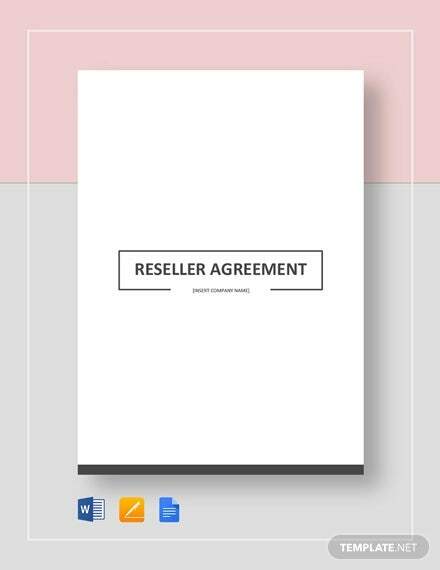 Every kind of Vendor Agreement will have to provide for the specific relationship between the wholesaler (or product licensor) and the reseller (or retailer). Some distributors or retailers resell at a loss, and some raise the price. If you are in the latter group, use the Value Added Reseller Agreement Template so the licensor understands your profit motive. 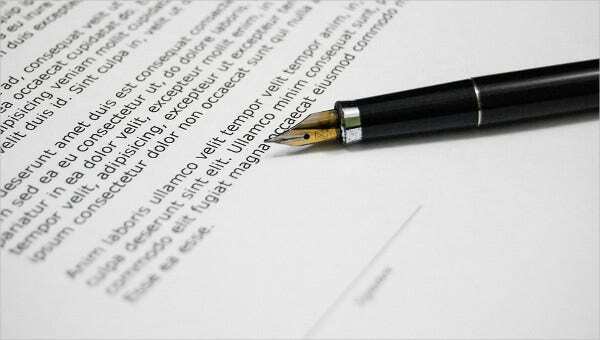 Some of these contract templates may already cover the general situation you have. In which case you can go ahead and download and print them. 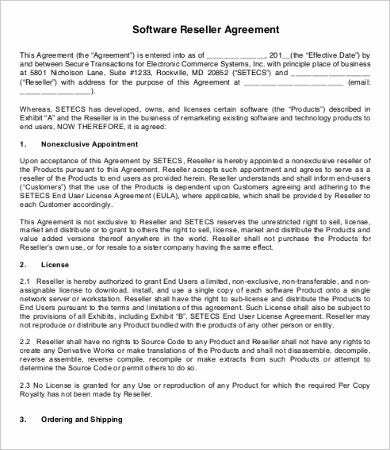 For general purposes, the Standard Reseller Argument and Reseller Contract Agreement Sample should be useful. It is always recommended to have a lawyer go through the terms and conditions to make sure your specific needs and considerations are being met. You can then easily edit the template to reflect this.